Our unique and industry-leading approach to bioinformatics is to build a core competency in a single entity that is deployed against all activities ranging from biomarker discovery through assay development and into clinical product deployment. This concentration of our expertise ensures our bioinformatics team has broad experience and skills to support an agile, modular software development approach. The core Asuragen software incorporates a set of proprietary algorithms that enable us to extract maximal insights from results across the discovery and development continuum. Incorporation of these algorithms into our routine R&D and clinical work, coupled with a machine learning strategy, ensures they constantly evolve and remain cutting-edge. Our expert team pairs these unique algorithms with easy-to-navigate GUIs that optimize customer usability while maximizing clinically-relevant, data-to-insight results. Integrating complex analytic capabilities with our software in a “push-button”, automated data-to-insight approach significantly reduces the need for manual data interpretation. Our “end-to-end” approach to product development ensures software is tailored to support our chemistries and simplifies end-user experience, dramatically reducing hands-on and training time. Our Reporter software solutions combine machine-learning algorithms with integrated QC capabilities and run metrics to enable automatic and accurate result calling. Our proprietary Sample-Aware™ capabilities ensure constant result quality monitoring and reduce false positive results while highlighting false negative risk. 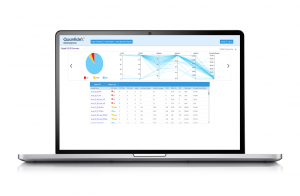 Our QuantideX NGS Reporter software uses a machine-learning algorithm, and is trained to be Sample-Aware™, optimizing results as a function of sample input quality. This enables increased sensitivity and reduces the false positive rate in high quality samples, while highlighting false negative risk in low quality samples. Automated analysis further reduces the need for subjective interpretations. Push-button analytics & reporting suite | Set up and go workflow designed for easy installation and implementation, right out of the box. Runs directly on lab desktop | Install locally on a standard Windows® desktop computer. No prior bioinformatics experience or large server environments required. Comprehensive reporting | Full bioinformatics and reporting of variants (SNPs and indels), and standard QC metrics are automatically calculated. Integrates QuantideX qPCR DNA QC Assay | Sample-Aware™ bioinformatics that factor in functional template copy number, dramatically reducing false call rates. Seamless updates offered with new panel designs & variant annotation | Software updates allow new panels to be adopted without re-investing in analytics when incorporating Asuragen QuantideX NGS panels. The AmplideX PCR/CE FMR1 Reporter provides highly accurate FMR1 sizing with automatic and robust size calibration, elimination of noise artifacts and the integration of batch-level QC and run metrics.